What are all of the different ways to modify Drupal output? OK. Now that we've set a conceptual base line for why we separate out the logic from the presentation when we build out code, we're going to start looking at some practical techniques for modifying the output of Drupal, some of which are going to take code and going to take that separation of logic from presentation, but a lot of them are going to be based on configuration changes in Drupal or contributed modules that allow us to modify certain aspects of Drupal that are very difficult to do from the code side of things. And we'll also take a look at several techniques that employ CSS to override the location of a certain aspect or hide a certain component on the page. If you've ever had to make a modification to Drupal output and found your head spinning a bit because you just weren't sure how to approach it, there's a good reason for that. And it's because there's usually multiple approaches you can take to modify the same thing. Typically, some of them will have advantages over others, and so what we're going to do next is take a look at what tools we have in our toolbox to make those modifications. And then we'll take a look at how to match up a modification to a particular technique based on our needs. 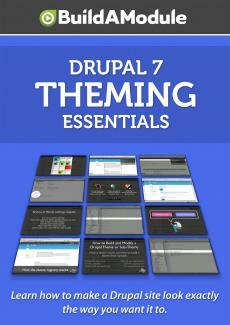 Probably the simplest tool we have available to us are the variety of settings that Drupal supplies us. For example, if we go to edit a content type, we see that there are a number of ways that we can modify the output of a teaser or a full page output for a node. For example, we can hide a particular label, we can change the order of fields, or change how the field is output with a field formatter. There are also settings that allow us to structure the location of our blocks throughout a page as columns or in the main content of the page or the header or footer. There are also more general settings which we can modify, including the site name and uploading a new site logo or favicon. Besides these, there are multiple additional points where the output of Drupal can be modified through simple configuration changes; and the advantage to taking this approach if we can, is that it's expected, so anybody who comes to administer a Drupal site will check these locations first because they're common across all Drupal sites. It also allows us to reduce the amount of custom code that's required to get the output that we would like, which will ultimately make our site more maintainable. Another tool that's available to us, is to extend the configuration options available through the user interface by installing contributed modules. For example, in a future video we're going to look at the Display Suite module, which allows us to add custom build nodes to our nodes. A build mode, for example, is a teaser or a full page, those are two different build nodes. And to add an additional build node would typically require some coding, but with Display Suite we can add an additional build node through the user interface and allow the user to use those in views, for example, or on various pages on the site. The advantage to this approach over adding custom code is the same as using the core configuration pages. It gives us the opportunity to reduce the amount of custom code required on our site while exposing more of the data to people in a way that is standard across many Drupal sites. So not all sites will have a particular contributed module installed, but there are modules that are standard enough that if people want that functionality exposed, they will go to a particular module for it. So they'll know where to go for more information or documentation. A third tool we have to work with is CSS. CSS allows us to position elements on a page, or give a particular look or feel, or even hide an element on a page without having to create any custom code. Again, using this technique allows us to reduce the amount of custom code required for our site to run, and this is often a standard way of positioning or changing the visual aspects of elements on a page, so that will be where people will look to. They'll look to the CSS files. One more tool that we'll look at for modifying the output of Drupal through the theme layer is through the Theme Settings form.